I’m a bit of a baby when it comes to skin treatments. I like organic natural products, gentle treatments and I don’t like pain. And I especially don’t like downtime. I mean who has time for downtime? Downtime makes me nervous. What if the swelling, redness or bruising is really bad and takes weeks to go back to normal? What if my skin never looks normal again? No, I’m not cut out for extreme treatments. Having said that, I’m always on the look out for something that will give a natural result and make my skin look great. Something safe with minimal risk. I’ve been doing radio frequency treatments for a number of years now and absolutely love them. Pain free, relaxing and great for giving skin a collagen boost. It helps keep skin tight and I honestly believe that although the results are very subtle, the fact that I’ve been doing them fairly regularly for the past five years, has slowed down the speed at which my skin is ageing. So off I went to see Dr Khan at The Harley Street Skin Clinic. I absolutely love this place, because not only is it cosy and welcoming, but they do everything a girl could want, from the most gentle skin treatments to a full on facelift, if you’re so inclined. Dr Khan knows me well enough to know that I don’t want to take any unnecessary risks and that I like a natural result. However I also want to take full advantage of what he has on offer. And I trust him implicitly. He will always take a conservative approach with me which is what I think you want in any doctor doing these kind of treatments. It would give me a bit of redness the first day or two, possibly some mild swelling and I might flake for a couple of days. And he would apply anaesthetic cream to my face before the treatment because lasers, unlike radio frequency treatments, can be painful. And I would do a series of about four, one week apart. I was a bit worried about how painful it would be and apprehensive about the level of redness. Also the flaking. As an actress a meeting could come up last minute or I could be thrust in front of a camera with a moments notice, so any downtime is very risky. But my diary was clear and I decided to just go for it. I arrived at the clinic a half hour before my treatment so they could apply the anaesthetic cream. Co2 lasers are the most powerful on the market and give very good results. A small wand like device is used and stimulates skin rejuvenation. 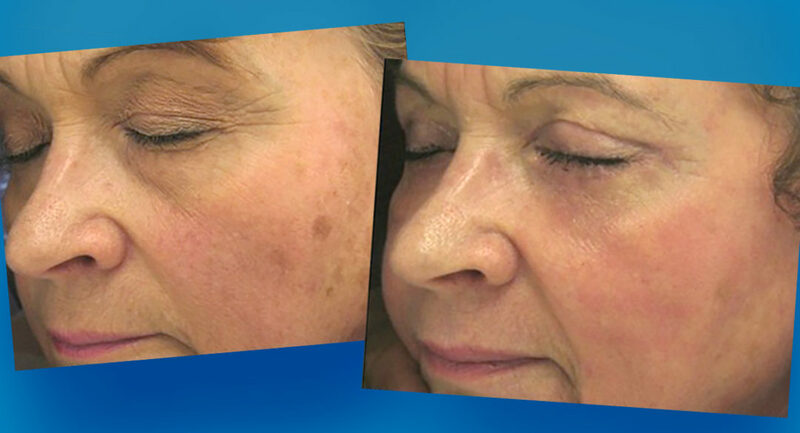 By creating thousands of microscopic spots and hitting only small areas in depth, it eliminates the usual side effects of laser resurfacing such as pain, scabbing and swelling. It also doesn’t remove the entire skin surface so redness is minimal and lasts a short time. I was thankful for the anaesthetic cream however as it did sting a bit and was quite hot but completely bearable. The worst part was that my skin felt very, very hot after he had finished and for the rest of the day my skin was extremely red. I definitely would not have wanted to go out that night. He gave me a surgical glove filled with iced water to hold against my hot face which was a life saver. However I had no swelling whatsoever. Miraculously when I woke the following morning, the redness had all but gone. Just a teeny bit remained and my skin had started to go a bit brown as with too much sun exposure but was easy to cover up with make up. Just as well because sods law, I ended up having an audition for a film that day. I felt a bit self conscious but I guess I looked ok because I got the part! After a couple of days my skin felt very dry and began to flake a lot. This was the worst part because flaking is impossible to hide. It was very flaky for a day and then continued to flake slightly for a few more days. During this time my skin felt dry and horrible but the truth is no-one seemed to notice or make comments so I guess it felt worse than it looked. I was due to go for another treatment exactly one week after the first one but decided that my skin needed a break before going through all that again so decided to do the treatments every two weeks. Dr Khan said that I’d had a much bigger reaction than most people. My flaking was more extreme and lasted for longer. Why? Why? I guess we’re all different and react differently. Or maybe I simply had more dead skin to get rid of? I did four treatments in total and the flaking did get a bit less each time although I always felt it took a good week for my skin to go back to normal. (I started filming after my last treatment while I was still in the flaking stage and the make up lady didn’t notice a thing). My skin did look smoother and definitely tighter after the treatments and Dr Khan said to wait another 4 – 6 weeks to see the full effect. And sure enough after about a month I noticed that my skin was looking really good. Completely natural and glowy, firmer, smoother and better than it’s looked in ages. And four months down the line, it continues to look this way. Definitely. 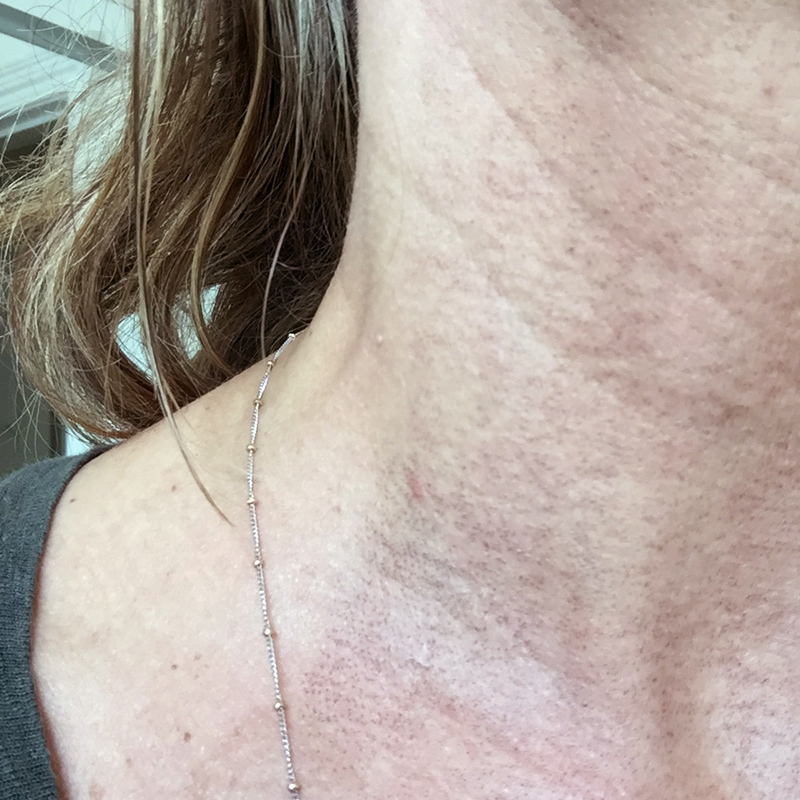 The redness on the first day is unpleasant and the dryness and flakiness is a drag (keeping in mind that most people have much less of a reaction than me) but it’s very short lived and the results are long lasting and truly fabulous in a very natural way. If you want a pulled look or a very visible difference then probably this won’t be enough for you. For me, this natural but real result was just perfect. This treatment is particularly good for sun damaged skin (me), acne scars, fine lines and wrinkles and pigmentation marks. Dr Khan recommended an SPF 50. Now I’d thought that anything over an SPF 30 was a waste of time and just full of chemicals but Dr Khan said there is new evidence that in fact an SPF 50 does offer more protection. I ended up using a moisturiser from a unisex range called Monroe that contains an SPF 50. This range is made in association with the Harley Street Clinic. It’s not completely chemical free but is paraben free and I liked it very much. There are not many chemical free SPF 50’s around but another good one is SkinCeuticals Mineral Radiance Defense SPF 50. Needless to say, sunbathing after these treatments is not an option. I would recommend doing it in the winter months if possible. Only the photo from mid treatment on my neck which was a bit of a shame I suppose. I would love to have that laser treatment but the thought of having redness and flaking turns me right off.I prefer to have gentler treatments like a facial once a month and using organic cosmetics.